Koreans are getting taller, lighter and thinner, according to a study released Thursday by the Korean Agency for Technology and Standards. The agency studied the physical characteristics of Koreans in their 20s and compared them to other age groups. As Koreans grow taller, their legs are getting longer in proportion to the body. Of two Korean men, one in his 20s and one in his 50s both 175 cm tall, the younger man's legs are 1.22 cm longer, measuring 80.15 cm. The legs of women in the same age group were around 2 cm longer than those of their middle-aged counterparts, measuring 72.08 cm. Overall, the legs of 20-somethings were around 2 cm longer than those of the older group. Given that 20-somethings tend to be around 6 cm to 8 cm taller than those in their 50s, young Koreans are taller and thinner, more closely resembling western physiques. The average ratio of total body length to head length is 7.2:1 for Koreans in their 40s but for those in their 20s 7.3:1. "Koreans have grown taller while the size of their heads remains the same," a KATS spokesman said. An increase in dieting has caused the number of underweight people to rise in all age groups. In 2003, 11.5 percent in their late 20s were underweight. This year, that rose to 15.7 percent. In contrast, the ratio of obese people has decreased. Among people in their 50s, 50.3 percent were obese in 2003, but this year the ratio fell to 39.4 percent. But the proportion is growing among younger men. Yoo Jae-woo, a professor at Kangnam University who headed the study, said, "The rate of obesity among Korean men in their late 20s and early 30s has increased significantly because they spend more time in front of the computer and less exercising." Overall height seems to have reached a ceiling in 2003, with men on average 174 cm tall and women 160.5 cm. Among women the speed of growth slowed down at the age of 12 and at 15 for men, resulting in only between 4 cm to 5 cm in additional height afterwards. 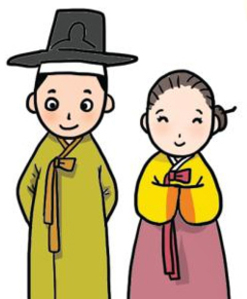 "Until the end of the 1990s, Koreans' overall height continued to grow thanks to better nutrition. That it has remained at the current level since 2003 seems to be due to ethnic reasons," the spokesman said. The survey involved 14,016 men and women between the ages of seven and 69 using three-dimensional body scanners.